Contact us for career advice. We’re here from 8am to 6pm Monday to Friday. Want to study but not sure what to do? What are your work values? How does work fit in with your life? What help should schools provide with careers? Disagree with your child's career choice? Ready for a career change? What's happening in the job market? Collision repair technicians repair and replace damaged body parts of cars and other vehicles. Source: Collision Repair Association, 2017. Chances of getting a job as a collision repair technician are good due to a shortage of workers. 3-4 years of training usually required. Pay for collision repair technicians varies depending on qualifications and experience. Apprentices may start out on the training minimum wage, the minimum wage, or a little more. After one to two years they usually earn between $19 and $20 an hour. After two to five years they usually earn between $20 and $25 an hour. Collision repair technicians with over five years' experience can earn between $25 and $35 an hour, and may receive other benefits. Very experienced collision repair technicians or those running their own business may earn more than this, but for those who are self-employed, income depends on the success of their business. some knowledge of spray-painting techniques. 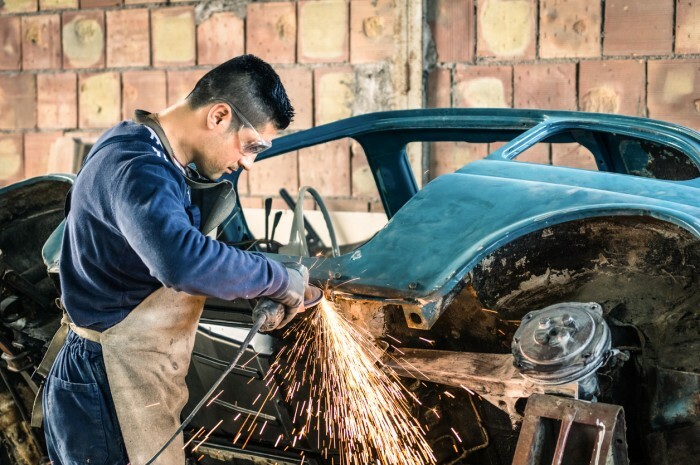 Collision repair technicians who run their own businesses need small business skills. work in conditions that may be noisy and fumy, so they need to use protective equipment. What's the job really like? [I do] panelbeating – lots of of bogging, stripping, full-on repairs, cut, weld. I also even help out the painters a bit, help out the glass guys too and the auto-sparkies, so you do get a nice variety being the apprentice. It's absolutely different every single day – you'll never get the dents the same, you'll never get the the same kind of car, never the same strip – it's really good. So there is a lot of theory work to do for the apprenticeship – you really have to put your head into it. It doesn't help if you can do all the work but not have the piece of paper to show for it, you know? Opportunities for women? It's a great opportunity – it's well worth it. I plan to go learn how to air-brush, do some old-school cars, you know some hot rods, paint some dragsters! I do wake up in the morning going, "Yep! I'm happy to go to work today." It is awesome. There are no specific requirements to become a collision repair technician. However, a New Zealand Certificate in Collision Repair may be useful. New Zealand Certificate in Collision Repair – Non-Structural Repair (Level 4). MITO oversees collision repair technician apprenticeships. No specific secondary education is required for this job, but many employers prefer apprentices to have at least three years of secondary education. Useful subjects include maths, construction and mechanical technologies, and English. For Year 11 to 13 students, the Ignition and Accelerate StartUp programmes run by MITO are a good way to gain industry experience. National Certificate in Motor Industry – Foundation Skills (Level 1). These programmes may help you gain an apprenticeship, but do not reduce the amount of time it takes to complete it. good at problem solving and basic maths. What are the chances of getting a job? not enough people completing apprenticeships in collision repair. About 2,500 collision repair technicians work in New Zealand, but this is not enough to meet the demand and employers find it difficult to get staff. As a result, panelbeater (collision repair technician) appears on Immigration New Zealand's immediate skill shortage list. This means the Government is actively encouraging skilled collision repair technicians from overseas to work in New Zealand. motor vehicle dealerships such as Ford or Toyota. About 17% of collision repair technicians are self-employed, and 11% employ other staff. 1 News Now, 'The Industry's Still Tarnished with that Dirty Brush – Panelbeaters Cry Out for Apprentices', January 2017, (www.tvnz.co.nz). Immigration New Zealand, 'Immediate Skill Shortage List', 25 June 2018, (www.immigration.govt.nz). Ministry of Business, Innovation and Employment, '2006-2014 Occupation Data' (prepared for Careers Directorate – Tertiary Education Commission), 2016. Pritchard, N, general manager, Collision Repair Association, Careers Directorate – Tertiary Education Commission interview, October 2017. Collision repair technicians may progress to set up their own business, or become assessors, tutors, or estimators. Some collision repair technicians specialise in a particular aspect of the job, such as body work or painting. Automotive technicians service and repair vehicles and their parts and systems. Automotive refinishers prepare vehicle surfaces, match and mix colours, and apply paint to vehicles. Fabrication engineers make, install and repair metal products such as vents, handrails, boilers, aircraft and boat parts, or beams and girders for construction projects. Coachbuilders manufacture and assemble frames, panels and parts for vehicles such as buses and motor homes. Vehicle trimmers install and repair the upholstery of vehicles. Tyre technicians remove, repair and fit tyres for all types of vehicles. They also advise customers on different types of tyres, and check and adjust vehicle wheel alignment.